Habitat and ecology: Mammillaria sheldoniidwells in gravelly slopes, hillsides, and plains. 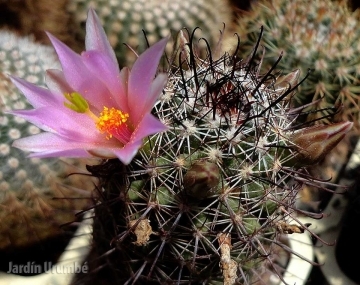 Description: Mammillaria sheldonii (Mammillaria grahamii subs. 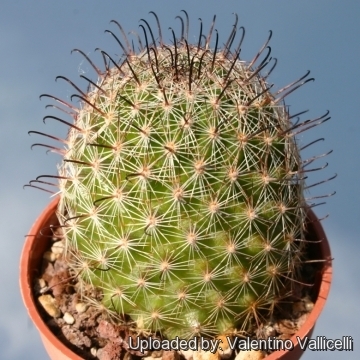 sheldonii)is a small cylindrical cactus simple or with several heads from base of the plant, with white radial spines and dark brown hooked centrals. The flowers are pink with darker midviens and typically with green stigmas. It is undoubtedly a variable species, which has given rise to several names now ascribed to synonymy. 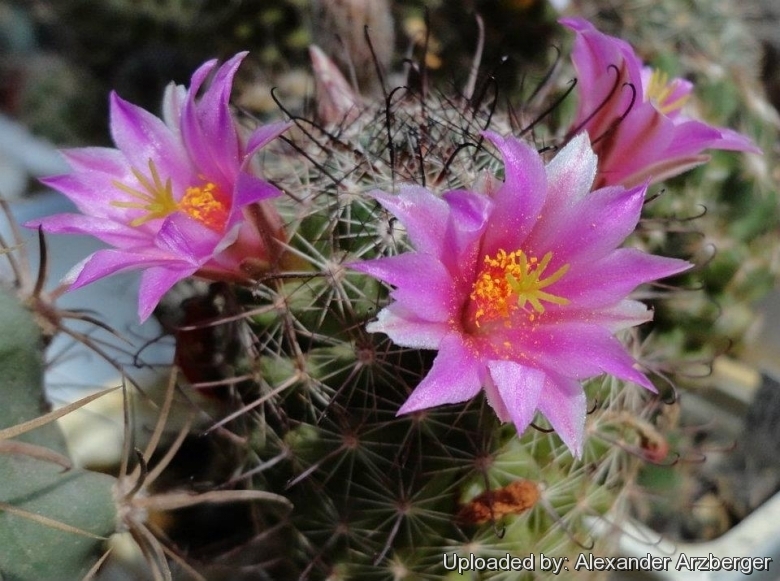 Derivation of specific name: This member of the Cactaceae family was given this name in honour of Charles Sheldon (1867–1928), US-American naturalist, once owner of a successful mining business in Mexico. Habit: It makes a cluster of basal stems. Stem: Spherical to slender-cylindrical, dull green, often becoming reddish, 3-6 cm wide, 8-15(-25) cm tall (or more in cultivation). 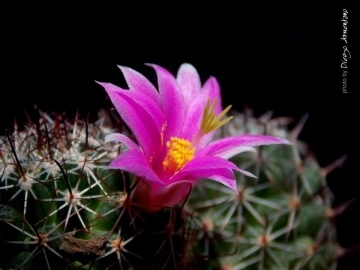 Radial spines: The number of radial spines mostly 12-15, bat varies from as low as 9 (Mammillaria alamensis) to as many as 24, needle-like, about 6 to 8 mm long, white, tipped reddish brown with purplish tips,. Central spines: 1 to 5 (0 in M. alamensis), dark reddish brown to purplish, the upper part dark blackish brown. 1 to 4 upper ones (if porrect) straight, 8-9 mm long a little stouter and darker, the lower one (or two) elongated and either straight or hooked with upturned hook at end, 1 to 15.cm long. Flowers: Large, wide funnel-form, diurnal, inodorous, light purplish-pink with a pinkish brown midstripe and paler margins, about 2 cm. high, 2-3 cm in diameter (up to 3,5 in M. alamensis). Outer perianth segments linear-lanceolate, olive-green at base, brownish green with pinkish green margins above, acute, ciliate. Inner perianth segments about 10, broad, acute, pink to purplish with white margins, to 7 mm wide. Filaments and style light purple. Stigmas-lobes 6 mostly olive green (Orange in Mammillaria pseudoalamensis) at times purple-pink. Blooming season: Spring ( March-April), and flowers remain open for about three or four days. Fruits: Club shaped, pale scarlet 25-30 mm long. Edible. Seeds: Globose, slightly constricted above base, about 1 mm long, glossy-black and slightly pitted. 9) Heil, K., Terry, M. & Corral-Díaz, R. 2013. Mammillaria grahamii. The IUCN Red List of Threatened Species 2013: e.T152723A670512. http://dx.doi.org/10.2305/IUCN.UK.2013-1.RLTS.T152723A670512.en. Downloaded on 21 April 2016. Cultivation and Propagation: Mammillaria sheldonii is a large-flowered mammillaria which is sometimes difficult to cultivate. This plant blooms easily and needs lots of light. Use a pot with good drainage and a very porous mineral-based potting mix. Potted plants are quite wet-sensitive, especially in light of its small root system. Water sparingly during the growing season, let soil dry in between to prevent root rot, keep very dry in winter. Feed with a high potassium fertilizer in summer. Usually it is recommended to over-winter this plant in a bright and warm greenhouse with at least 8-10° C, but it has proven to be quite frost resistant (if kept dry it is hardy as low as -7° C). A resting period in winter and strong light are necessary so that it can flower properly.